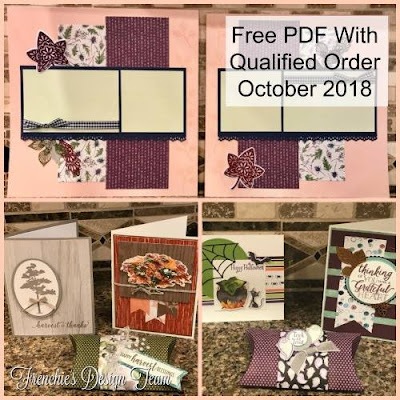 Today I wanted to show you how the new All is Bright Designer Series Paper works beautifully with the Christmas Pines Stamp Set and the Pretty Pines Thinlits Dies from the Annual Catalog. As you can see from the pictures this is a fancy fold card and it's actually the same type card I created a few months back with the Fabulous Flamingo Stamp Set, but I've changed the orientation of the card to horizontal instead of vertical. If you missed the how to video for creating this type of fancy fold card you can watch the video now by CLICKING HERE. I've chosen a different design of the photographic paper from the All is Bright Designer Series and this time I've backed it with the Yellow Gold Piece of the Joyous Noel Glimmer Paper Pack. I stamped my Noel Sentiment from the Christmas Pines Stamp Set in Shaded Spruce Ink and cut it out using the second from the largest Stitched Shape Framelits Oval. The Real Red Oval Layer and Yellow Gold Joyous Noel Glimmer Oval Layer are cut using the Layering Ovals Framelits third and second from the largest. I finished off the card by cutting my pine cones and layering them and the bow together with Tombow Multi Purpose Glue and popped them up with a dimensional, which acts as a closure device for the front of the card. I placed a piece of Very Vanilla cardstock on the inside and stamped a few of the pines bows at the bottom to add continuity. I must say I love how it all came together and hope you do as well. Card Base: Shaded Spruce - 8 1/2" x 11"
First Layer - Joyous Noel Glimmer Pack Gold - 5" x 3 3/4"
Second Layer - All is Bright Designer Series Paper - 4 1/4" x 3"
Third Layer & Pine Cones- Joyous Noel Glimmer Pack Gold - 5" x 3"
Fourth Layer - Real Red - 3 1/4" x 2 1/2"
Fifth Layer - Very Vanilla - 3" x 2 1/4"